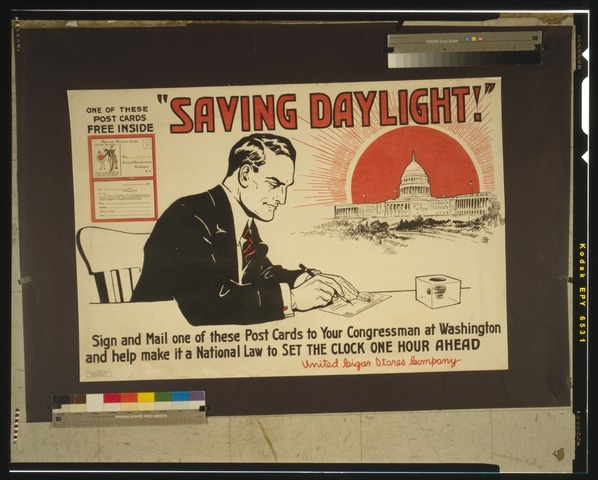 Daylight Savings Time was inspired by a whimsical essay by Benjamin Franklin (probably not the first time that politics fell for something like the Sokal hoax?). The official goal was energy savings – and results are ambiguous. Frankly, I don’t care about that anyway. I believe that the losses in human productivity caused by misguided attempts to tinker with our biological clocks would outweigh those spurious gains. Randall is a journalist who got interested in sleep research because he hurt himself while sleepwalking. Researching what science has to say about sleep he was then surprised to find out how few we know. Even the simplest assumptions are not sacred – sleep is not necessarily intended to be “consumed” as 8 hours at a time: Our ancestors (across cultures) wrote about the first sleep and the second sleep – two blocks of sleep interrupted by a longer break. Today such people might ask for medication to cure their insomnia. Randall’s book gives an easy-to-digest summary of some results of sleep research and chronobiology – that seem to be distinct disciplines thanks to compartmentalization in science. Sleep researcher Cartwright covers the nature of sleep as such. She tries to clarify why we need to “waste” one third of our lifetimes in this strange state of mind. Biologist Roenneberg explains what triggers sleep and how our internal clocks are synchronized with external cues. I recommend these two books by scientist pioneers in their fields. I was also most impressed by Cartwright’s CV who received her PhD in 1949 and published this book in 2010. It is creepy and fascinating what people can do when sleepwalking, such as murdering their beloved ones without recollecting anything later. Both Randall and Cartwright cover exceptional cases that caused some stir in the media – summarized also in this publicly available scientific paper by Cartwright on sleepwalking violence (Link now broken). It is especially emotionally troubling “content” that requires processing – and in particular if the troubling nature was not obvious. This seems plausible to me: Isn’t it often an incidental remark dropped by somebody else that remains unresolved and bothers us longer than we consciously are aware of it? And that sleeping over it make the uneasiness go away? Cartwright’s own research on patients depressed because of life events (divorces in that case) give prove of the healing power of REM sleep, depending on the capabilities of the patients’ “processing systems”: The change in patients’ moods after sleeping and during the day turned out to be an indicator of when and if patients would eventually recover from depression. But I don’t care so much about the details here. As Nassim Taleb laid out in Antifragile: Don’t care about the scientific details of biological processes if you know from experience that they work (applied to fitness and health). Grandma knew it that sleep was important. Having accepted that sleep needs to be good for something and science will eventually find out how that works in detail the really important question for us, practitioners of sleep, is: When and how much? And that’s why I found Roenneberg’s book most useful. We really sleep 8 hours on average. It is not at all a shame not to comply with this ideal of Very Successful People who claim to or really need only 5 hours. Midsleep is used to tell owls from larks – this is the midpoint of sleep in terms of local time. Midsleep indicates that we are not a world of early risers: The distribution peaks between 4 and 5AM! So actually most of us rise shortly after our biological midnights. Distribution of chronotypes in the German population (Wikimedia, University of Munich). The left diagram exhibits the start and end times of sleep for an average (8 hours) sleeper – thus effectively “midsleep”. It peaks for 0-8 sleepers, at midsleep=4:00AM. The right diagram shows the lack of sleep on working days (Arbeitstage) and free days (freie Tage). Roennebergs speculates about some professions being self-selective for early risers and short sleepers – especially decision makers. So there might be some truth to that magazine articles about A Day in the Life of Somebody Very Important who gets up at 4:00AM to meditate in the Zen garden, then plays with the kids, then heads to the airport – quickly buying and selling some companies over the phone,…, and finally meeting other important beings for wine-tasting and networking in the evening. If human beings are left to themselves in a time-free bunker – even shielded from vibrations caused by vehicles or the earth’s magnetic field – most of them are guided by a free-running clock with a 25 hours period. However, experiments showed that some of the “days” might even last for up to 50 hours, and subjects don’t notice – they also eat only half of the meals. A minority of larkish people is equipped with an internal clock with a period of less than 24 hours. There was no evolutionary need to come up with a precise free-running clock because the internal clock gets synchronized daily to the rotation of the earth via external zeitgebers. (German for “time givers” / “signals”. I was delighted to learn that Germans pioneered chronobiology so not only eigenvalue and kindergarten entered the English language). The most interesting part for the physicist in me was to learn how this so-called entrainment works. It is about phase-locking two oscillating systems, a process well-known in physics (Here is a paper for the mathematically inclined, and here is an overview by Roenneberg that is a bit more detailed than the related chapter in the book). The zeitgeber is light – sunlight or other, the wavelength does not seem to matter much but the intensity and the point of time does: Roenneberg uses the analogy of the proverbial child on a swing as the free-running oscillator – which is pushed by a person, the zeitgeber, periodically. Consider the pusher acting on the swing at different times – it will either accelerate or decelerate the swing, depending on the relation of phases so to speak. When it pushes before the internal clock reaches its internal midday it tells the internal clock to hurry up. When it pushed at the “internal afternoon” it tells the internal clock to slow down. If the internal midday would coincide with the sun’s midday the effects would cancel – in the first half of the day the period is compressed but in the second half expanded again. If the internal midday occurs well after the sun’s midday then the expansion effect is not as effective as the compression effect: Owls make more use of the compression part of the cycle than of the expansion part The sun has already set when it would need to expand the day again. These sleepers “have to” get up late sp that they their internal midday is shifted to the external clock’s afternoon. 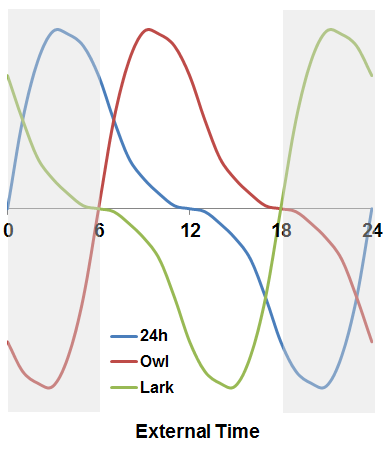 For larks it works exactly in the opposite way: They are early risers to fully benefit from the expansion while part of the potential compression effect of the zeitgeber remains hidden in the period before sunrise. Artifical light during the day is a zeitgeber too weak during the day but too strong in the evening. Farmers tend to be earlier than office workers on average. Cities are polluted with light – so people in rural areas are earlier than city dwellers. Inhabitants of Eastern Germany wake up earlier by some minutes – and alleged cultural remainders of “former East Germany’s work ethics” are easily debunked by noting that also former West German cities at equally Eastern latitudes fit the pattern. Now guess: Until when do waking hours exactly change with the sun rising at a different time every day? It is exactly until the dreaded last Sunday in March. Exactly until October when we get our precious hour back, our waking hours are erratic and uncorrelated with sunrise. It is interesting that these points of time are not even symmetrical to the equinox so it is difficult to come up with any other explanation than DST severely messes up the internal clock. Roenneberg generally turns these “sociological” explanations on their heads, such as the so-called disco hypothesis that states that teenager simply should party less and go to bed earlier. But teenagers become owls and turn earlier again in their twenties. It might be explained by an evolutionary advantage in stone-age cultures where young men were on a hunt all the night and not the whole tribe slept at the same time. What if teenager party because they cannot sleep and not the other way round? About 60% of grown-up people in Germany work schedule against their inner clocks today – so why impose the falsely glorified Early Bird’s lifestyle on them, such as school starting at 8:00 AM or earlier? I think Roenneberg is right in assuming the self-selecting effect of decision makers, teachers and doctors. Politicians are always ready to utter the stereotypical Children are our future! (when asked to give a speech on opening the renovated school) but they see insurmountable barriers in changing the timetables of local buses that absolutely have to transport both school children and workers. I am absolutely baffled by the ignorance of scientifically (or better empirically) proven facts – for the sake of purporting cultural myths and questionable ideals. As I know too well you can turn yourself into a fake short sleeper and fake lark with sheer willpower and misguided self-discipline that might be better invested elsewhere: I had quite a track record as the person who got e-mails like Do you ever sleep? as responses to e-mails I sent at 23:55 and then again at 4:05. This does not at all mean that you can ever sync your internal clock to that pattern and re-train as a lark. As Roenneberg explains: People need an alarm clock for decades of their careers and never “get used” to the larkish schedule. My theory is that decision makers designing schedules for corporate employees or students are well aware of the pain of getting up in the morning as some of them have to be owls, too. I think it is the same social dynamics that is at play when the finally tenured professor forces overworked graduate students to put in more hours and asks why they don’t work on weekends or when heads of departments in hospitals expect young doctors to work the same insane schedules they had once, too. If you have inflicted a grueling routine upon yourself for some years it is probably understandable that you can’t help but feeling – and uttering They should suffer, too! But it maybe should not become the assumption underlying political decisions. Life Between Clocks: Daily Temporal Patterns of Human Chronotypes by Roenneberg et al. This entry was posted in Life, Life the Universe and Everything, Science and Technology and tagged Biological Clock, Books, Chronobiology, Daylight Saving Time, Entrainment, Internal Time, Science, Sleep, Sleep Research by elkement. Bookmark the permalink. I’m sure that if a business would force all its workers and employees to start to work one hour earlier, the unions would come to the streets. Regardless an entire nation. Thanks, Bert! That’s a clever argument – I will keep it in mind for my next DST rant 🙂 And people have sent me also interesting links, e.g. about heart attacks peaking at DST Monday morning! Great post on a subject that is so fundamental that we just suffer it instead of dealing with it. I did irregular shift work (as an particle accelerator operator) and learned how to adapt my clock as well as possible, the main trick seemed to be to drink loads of water, no alcohol and no heavy meals. It was also important to go to bed and not hang around at 7AM as my body tried to tell me to get up when I had just been awake for 20+ hours. I then did a lot of travel and dealt with jet lag. Unsurprisingly the clock adjustment physiology is the same as with shift work; whether in a plane or off it. So, DST makes me smile as it is just a 1 hour change. That’s like flying to London. But … I agree with your point on corporate cruelty. We should just work when it is best for us. I’m sure we can work out how to deal with common schedules etc. I agree that self-discipline helps a lot. From those books I learned that actually sports – and athletes having to compete with teams from other time zones – is a very important motivator for sleep research these days. If you would prepare in a “professional” way for the DST shift issues might be non-existent. I just can’t resist challenging the assumption that DST is there as it fell from heaven and now we have to deal with it in a professional way. It is a practice invented by bureaucrats some decades ago, and I expect good reason pro DST today. Elke, as a suffering victim of season affective disorder (SAD), I provide and opposing point of view. I HATE STANDARD TIME. This is probably something that should enter a calcuation of costs versus benefits. Though it’s most likely not really obvious from the post I try to be as objective as possible. If there is any good argument pro DST that will lead to higher economic productivity and/or a referendum proves that the majority wants to have DST for personal reasons, government should do it and I will succumb to utilitarian reasoning. Don’t think the issue is what time to keep but rather to get rid of the sem–anual adjustment of the clock that introduces a sudden shift in all schedules. It is well established at this point that this messes up bio-rhythms. Personally I can deal with it, but as a parent I really hate that it messes up the sleep schedule of my kids. Mangled that quite well, “sem–anual” should have been “semi-annual”. I fully agree – call the number on the clock whatever you want but don’t mess with it periodically. As I said to some other commenters the real for most people seems to be that their personal preference do not fit typical business working hours… something to be discussed with employers and clients but nothing that should invoke weird attempts by government to fix it by changing the time accoring to a certain percentage of people. I come from a country that has four time zones in Summer because of the disagreement over daylight savings. We usually only have three time zones. Also for completeness, I declare that we are still on DST here and will be changing back sometime next month. I love having the extra hour at the end of the day. You actually feel like you have not spent all the best time at work and that there is so much more you can fit into the day. The changeover does muck around with your body rhythms for a few days, but then it settles down. After all, world travellers chose to inflict themselves with the same thing when they cross time zones. Seems I have to surrender to the lovers of the extra hour at the end of the day 🙂 As I said to Dave in the previous comment – I believe all these issues would be solved if work would be more self-guided and results-oriented and less defined by something like official office hours. Then everybody could live, work, and learn according to chronotype and preferences – show up at 11:00 at work at come home early to spend that extra “sunny hour”. I feel even smaller businesses get more and more “global” connections so you have to work in asynchronous fashion with people in other time zones anyway – so why not allow for more flexible schedules? I do know the counter-argument about people working in say, hospitality industry, or nurses who don’t have that sort of freedom. Nevertheless, I think, the working life of many office workers is determined by schedules that are more rigid than they needed to be. That’s of course a valid argument, and it got me thinking: Isn’t this “additional hour at the end of the day” only an issue because the working schedules of most people are determined by some external constraints – such as an employer? If we could decide when to do what – we would not care at all what the clock says. “Thanks” to DST we have to start – and end – work one hour earlier, so there is this additional hour at the end of the day. And it is the same thing – having to show up in an office earlier at a certain time that bother the owls – no matter if this still makes sense on principle if work would permit a more self-guided and results-oriented way of working? (I am not speaking of myself here – I have no reason to complain about that any more). So what would solve all issues is actually re-designing our working and learning environments in a way that allows people to live and work more according to their chronotypes. Yes indeed … you have my vote there. In terms of my own (professional) work schedule that’s exactly what I have done. The majority of my colleagues work the usual day, 9 to 5. I, on the other hand, am in at the office from 6 to 2. To say that I love this sort of latitude would be an understatement. And, just so you don’t think I’m lazy … I set my alarm for 4 AM. I’m up and out and at the gym when it opens at 5 … I run my 5 miles, shower, all in time to get to the office just as the custodial staff is arriving at 6AM! Love it. That’s really a “best practice”, Dave! – Local time is the natural thing… open to debate – the most natural thing is of course working and living according to available sunlight. You might argue DST does restore this – I don’t think so as in my “heavy commuting times” the March/April/May early morning darkness always hurted me more than “summer evening darkness” would have done in DST-less times. – We need a reason to deviate from local time. The one once given for DST (energy savings) is not valid. – If we can measure the positive effects – on economy, energy savings, health or whatever, the official time should be changed. – If we cannot measure the effects unambiguously a referendum should ask people what they want. – Otherwise it’s a thing between employees and their employers and service providers and their customers etc. These relations become more flexible and individual – I hope. This semester my son Alan (5th year engineering student at Memorial U) has a work Term at the Hydromet Nickel Processing facility currently being constructed for Vale at Long Harbour, a distance of around 100 km from home. It’s a good work term. He works 10 hour days and is paid $20/hr–a good sum for an intern. Here’s the thing–he has to catch a bus each day to and from the work site. As a result he and I get up at 4 each morning so he can be dropped off at the bus stop, around 10 km from the house. Couple that with the fact that this winter has been rather cold (-20 C was often the temp when we set out) and you can see why neither one of us was too happy when the clocks “sprung ahead” a few weeks back. Elke, I feel your pain but enjoy the extra hour in the evening. Each evening now after work you and your husband can sit out and just enjoy a few hours of evening sun–something that is priceless. By the way, as you bask in your +20C temperatures I’d like you to know that today, including the wind chill the temperature is -11 and the weather report indicates that between Monday afternoon and Wednesday evening we will get between 30 and 60 cm of snow on top of the approximately 380 cm we have already received this winter. This argument of mine is as debatable and subjective as the “extra hour in the evening” argument in my point of view as the issue is not the clock but the fact that working hours inflicted on most people don’t match with their preferences. I believe the only real solution to this is to allow for more flexible working schedules. I have sorted this out for myself so I this post is not a complaint about my situation – I hardly ever have to work according to schedules defined by somebody else. Since I consider the whole thing an issue of negotiations with one’s employer, setting the rules for your own business etc. it probably strikes me a bit odd that it seems to be an acceptable proposal to resolve personal issues with business hours by relying on government to change local time so that everybody is forced to a work a different schedule – everybody including those who have equally valid and personal arguments against DST. Given the diversity of chronotypes and personal preferences I would assume that 50% of people love DST and 50% hate it. Assuming the energy savings argument isn’t valid (and I think most experts do agree on this) – I’d like to turn the question around: What would be the reason to change it? Is there really a good argument to say DST is the default and we need to give a reason why we should change it back to local time? This is not only applicable to DST but to very large timezones, too – all of China is on a single time zone so that for some people there it is “actually” 9:30 PM when the clock strikes midnight. Roenneberg says that people in that areas don’t lead their lifes according to the official clock – and I think this is finally the solution to the “DST problem”, too. I would just propose in a democracy: Do a referendum. I think there should be some argument pro DST that is different from: It has been that way for decades and we don’t want to change it back now. Oh wow – what a wall of text 🙂 Thanks for the comment! Be warned when naively correlating sun midday with clock noon: It varies 30 minutes in total in a year due to astronomical reasons. Lookup “Equation of Time” in Wikipedia. I take advantage of this extra hour for outdoor activities in he evening. As a practioner of sleep I can report that I easily adapt to the change within a few days. I know that my presentation of entrainment is rather simplified, not only in relation to the exact definition of midday – I also left the Y axis empty deliberately as Roenneberg did as the Phase Change Curve is not exactly the same as the strength of the zeitgeber. If DST should be based on people’s preferences – and not on that “energy savings argument” I think it would be fair to do a referendum. When I got into the security business, I had to override my internal clock completely. My Zeitgeber is no longer light. One day, I need to be a lark, the next, an owl. It’s not as bad as it sounds. It’s great that you can adapt somehow. Roenneberg, however, makes a convincing case, that light is really the only zeitgeber and social cues do not sync the internal clock. E.g. blind people whose eyes really lack all receptors for radiation go through a painful period every month if their internal period is 25 hours, as the relation between internal and external day is shifted by one hour every day. If the phase difference is half a period it is worst. But on principle somebody working night shifts would be able to sync using those “daylight lamps” and keeping the curtains shut in the day. Difficult to implement, I guess. But I know (from experience): what also helps is to be severely sleep-deprived all the time 😉 – as sleep pressure trumps the zeitgeber if it is intense enough. Daylight saving is like a cruel practical joke played on a dumbfounded humanity. To me it’s like a monument to human stupidity, but not to be outdone the US Congress proved that it can yet lower the bar on stupid, and so recently they decided that they weren’t happy with how stupid daylight saving was in the first place. No, it needed fixing by changing the rules of when the switch is to occur. That meant that every modern IT system that relies on timekeeping had to be patched. Given how many legacy systems are out there the amount of effort this caused was just staggering. I was lucky in that I only had to deal with patching some outdated Java JREs, but the entire time I had to do this I was cursing the American politicians who caused me this extra effort (as usual most of Canada just blindly follows whatever our neighbors to the South come up with – with the exception of blessed Saskatchewan. May have to move there some day when I just can’t take it anymore. Thanks, Henning! And I thought that the only Y2K-style issue we face now is that nodbody dares to undo DST because all those systems configured for DST automatically would need to be reconfigured. Fascinating research! Anecdotally, I’ve actually lived in two places without DST: Saskatchewan and Perth, Australia. The latter abolished it by referendum shortly before I arrived. I wish we could do something like that here (Ontario), but due to our economic ties with the US, it’s unlikely to happen. In the Australian case, it was only Western Australia that had abolished DST; the eastern states, which include the biggest economic centers, like Sydney and Melbourne, kept it. It would have been better if everybody abandoned DST simultaneously. I am not a big fan of online petitions – but if there is a global “owls unite / “DST haters unite” movement I would sign anything! Re owlish traits: Roenneberg also speculates about entrepreneurs being rather owls and larks and his hypothesis is that owls were more “challenged” at school at had to come up with clever strategists. I am not so convinced here – probably due to successful counter-examples of very successful larkish entrepreneurs. We need to wait for more clever algorithms mining Big Data! I have learned a lot from the comments here. I grew up in the time-change free zone of Saskatchewan, Canada, and have never been able to gracefully adapt to living out of the province. I felt profoundly out of sync with the world around me when I did live in zones during time shifts. I always suspected the root of my discomfort had more to do with the clock (regulating social activity) than it did the northern latitudes (with almost endless summer hours of daylight and almost no winter ones!). It would be very interesting to compare statistical data gathered in “time-free” zones with others. As a response to my post I have e.g. been sent links to articles that provide evidence for an increased number of heart attacks or accidents on the Monday after the switch to DST. Your owl-lark-theory is interesting. Probably creative / entrepreneurial people also like to be part of a minority – either of very late owls or very early larks? I admit, I think I did. For some time I had sincerely believed I am a (very early) lark who has just to get more sleep to live up to her genetic disposition. “Early lark” is also more unusual than “late owl”. So I blamed late conf calls with people in US time zones and the generally increased activity in IT communities in the late evenings for me not getting enough sleep and not getting up as early then as I would “naturally” do. Today I think my sleeping habits are rather average. I need 8 hours and I am bit owlish, as most people are. Indeed, if the meddling of Congress with DST had any upside, then that it proved that getting rid of it would be just as feasible. And in the latter case that’ll be very much a worthwhile effort.